Moving time: 5 hr 44 min. Wind: Light, variable. Not a factor. Weather: 55°F (13°C) in the morning; got up to 82°F (28°C) by end of ride at 4:30pm. Foggy during the morning; clear skies after noon. Perfect riding weather! Logging is a very large industry in Washington State. Businesses and houses often have signs in front of them that say "Supported by the logging industry" to show how much they depend on timber. Whole mountainsides show the scars of clear cutting and reforestation efforts. Weyerhauser (sp.) is the largest player in the timber industry and owns countless acres of land. From what I can tell, the common forest management method is to clear cut large tracts of land and then plant seedlings. Once these seedlings grow to a harvestable size then the process is repeated. 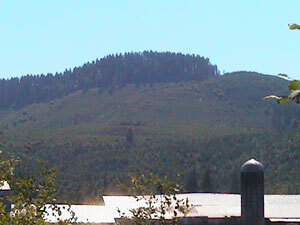 The picture below shows a single hillside with three sizes of trees. The trees on the ridge are quite large, the area below it has seedlings, and the lower part of the hill has trees that are about 20 feet tall. I saw three southbound riders on my way into Elma this morning and two more at the Post Office. I talked to the latter two about their adventure and shared some of mine with them. 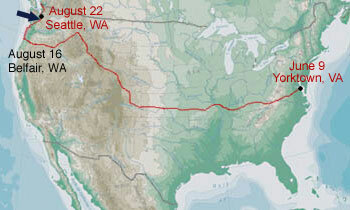 They started in Seattle two days ago and are headed south along the coast to the Mexico border. Both are from southern California and are on their first tour. They were at the post office to ship home unnecessary equipment - it only took them two days to figure out what they don't need. One guy asked about the terrain as the route heads to the coast. I dropped the bomb that there are hills and he didn't look happy. I hope he doesn't think Route 101 along the coast will be flat, because it certainly isn't. I'm not really sure that there are any routes that don't have hills in this country unless you're going to do a trip along the Missisippi River or a ride in the Great Plains. I picked up my e-ticket that Kelly mailed to me so I can fly back. Usually airlines only require a photo ID when you show up to the ticket counter but my airline went bankrupt. I'm flying with USAir instead (they have an arrangement with bankrupt Vanguard Airlines to take care of ticketed passengers) and the e-ticket confirmation letter is the only thing that will get me on one of their planes. I am staying at Twanoh State Park this evening. 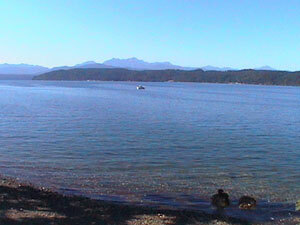 It is situated along the Hood Canal about ten miles south of Belfair, Washington. You can see the mountains in the Olympic National Park in the distance from here. The campground was completely full so the campground host told me to stay in the day use area. There's a nice enclosed pavillion with running water and electricity and I get to stay for free. The campsites only have a picnic table and cost $16.00. They never turn away hikers or bikers - I got lucky today. I can't believe that my ride is nearly over. 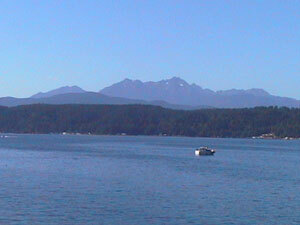 Tomorrow morning I'll have a short ride to Bremerton where I'll catch the ferry to Seattle. Once I get to the Hostel in downtown Seattle my ride is pretty much complete. Today's ride was very easy and relaxing, even though it was 80 miles in length and there were some hills to tackle. After two months of riding I'm in excellent conditioning and can do just about any kind of day on the bike that I need. In a way I wish I could continue on but I can't. I do feel closure to the adventure and look forward to a new year of teaching in a few weeks. It will be difficult getting back into the swing of things again. My daily routine has been dictated by the rising and setting of the sun. I eat when I'm hungry. I sleep when I'm tired. Soon I'll be living by the clock - especially at school with our bell schedule and all.